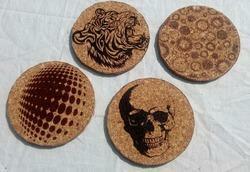 We are a leading Manufacturer of cork coaster printed from New Delhi, India. To fulfill the increasing demands of clients, we are highly engaged in offering PrintedCork Coasters in the market. This is ideally suited to avoid furniture from moisture. The offered products are made by highly skilled professionals using certified quality materials as per the laid industry norms. We are offering this product in different sizes at the highly competitive market price.